One of the proposed changes to federal tax law the Republicans are considering is eliminating the tax deduction alimony payers have. This would only be on new divorces so would not affect current orders. Most news reports on this focus on the fact people will not agree to such high payments without the ability to deduct the payments from their income taxes. No one seems to address the fact than many people, like me, are being forced to pay alimony. I never agreed to it. I only agreed to two years of support because I did not have enough money to go to trial and as a goodwill gesture. As it turns out a pointless one. The court imposed permanent alimony on me. “There is a difference between what is wrong and what is evil. Evil is committed when clarity is taken away from what is clearly wrong, allowing wrong to be seen as less wrong, excusable, right, or an obligatory commandment of the Lord God Almighty. The other, more interesting, thing no one points out is that the whole reason this is even an issue is because alimony costs the government money. Billions of dollars of money. Money other taxpayers have to make up for. And this is just the direct cost. 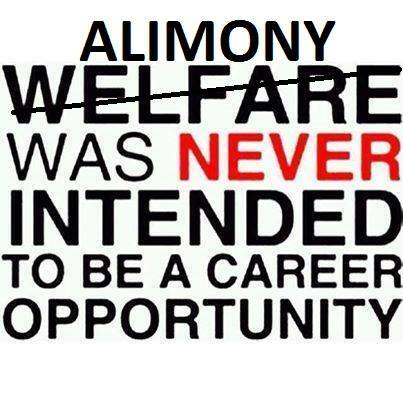 The vast majority of people who receive alimony are purposefully underemployed because it is a lot easier to get a check for doing no or little work than have to work. 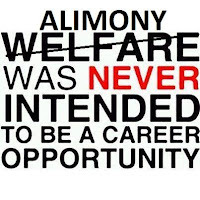 The cost to the government and our economy due to underemployment is many factors larger than the direct costs of alimony. Alimony affects everyone. Unless you are receiving alimony you are paying for it.